The cream of the crop among treadmill desks. The Everest desk possesses unparalleled typing ergonomics and unshakable treadmill desk stability, thanks to its signature SteadyType keyboard tray. Paired with the Everest is the ThermoTread GT, the cutting edge of office treadmills. The result is a unique walking workstation with optimal typing ergonomics, that's fit for the home or office. Standard shipping cost of $249 in the continental United States. Additional costs for AK, HI, Canada. DHL available for international. All of the iMovR Omega Desk models (Everest, Olympus and Denali) feature the patented SteadyType Keyboard Tray that gives them superior ergonomics for typing-while walking. Combined the exceptional performance, reliability and aesthetics of the Everest desk with the state-of-the-art, all-digital, ThermoTread GT office treadmill makes this our #1 recommended walking desk workstation. Its ability to reach an astounding 55" in height means that even the tallest users, walking on top of a treadmill, can still enjoy a highly stable desk platform. The Everest is entirely made-in-America and features the most extensive warranty on any treadmill desk workstation, but there's a cost. If you want to save a few bucks definitely check out the mid-tier Omega system, the iMovR Olympus Treadmill Desk. Or, if you can live with a manual desk (crank-up) instead of electric, save even more with the iMovR Denali Treadmill Desk. The best of the best, the Everest Treadmill Desk combines iMovR's top of the line desk with the most advanced office treadmill available on the market today, the ThermoTread GT. The combined system is remarkably quiet, reliable, versatile, and aesthetically pleasing. Numerous options allow you to customize your workstation with components that are designed to work well and look good together. There’s no higher pinnacle on Earth than Mount Everest. Likewise, there may be no better treadmill desk workstation combo on the market today than an iMovR Omega Everest stand up desk paired with a ThermoTread GT office treadmill. This combination brings together the elegant, reliable, ergonomically-advanced iMovR Omega Everest Sit Stand Desk with the most technologically-advanced office treadmill base available—the all-digital, iMovR ThermoTread GT Office Treadmill. The ThermoTread GT is the only office treadmill to currently hold our 5-star Experts’ Rating. Read our detailed review of just the treadmill base to learn more about how the 2015 introduction of the ThermoTread marked the end of the first generation of walking workstations, and the beginning of the second. We’ll cover the basics of both products below, but to find out more about the Omega Everest Standing Desk, read our more detailed review on it here. iMovR has come into its own right as a maker of a broad array of adjustable height desk and table models—ten lines of products by our last count. iMovR desks are known for their exceptionally durable and attractive 3D laminated surfaces, high quality componentry, and long warranties, as well as for having the most advanced ergonomic features for standing and walking workers. One of those features, the SteadyType Keyboard Tray, is built into each of their three Omega desk models (Everest, Olympus and Denali), making them the top desk candidates for pairing with any office treadmill. The ThermoTread GT can be combined with any number of suitable height-adjustable desks on the market, including the models made by iMovR itself. The Everest desk has long been a favorite to combine with other treadmill bases like the LifeSpan TR1200-DT3 and LifeSpan TR5000-DT3, thanks to its SteadyType keyboard tray’s treadmill-specific benefits. What makes the Everest-ThermoTread combination even more special, however, is a digital integration between the desk and the treadmill when they’re both connected to the internet using iMovR’s CloudStation adapter, an optional add-on component expected to be released next year. Read more about that below. Using data from its own extensive research into the ergonomics of using a computer while standing or walking, iMovR developed the patent-pending SteadyType keyboard tray to overcome two huge ergonomic issues present in other treadmill desks. The first issue is that if you want to use an adjustable keyboard tray to work in a more neutral posture and minimize “computer hunch,” the resulting “moment lever” often makes any two-legged desk rock like a fisherman’s dory in a Nor’easter. Of course, that assumes you can find a tray that’ll even mount to your adjustable-height desk without running into the crossbar under the tabletop. The second problem is that most conventional keyboard trays only adjust to a maximum of -15 degrees of tilt to avoid digging into your thighs while sitting. According to iMovR’s research, the most ergonomic hand and forearm position is between -30 and -40 degrees (the SteadyType can adjust to -85), at which typing speed and accuracy—regardless of walking speed—is restored to the same level as when working in a seated position. As the name implies, the SteadyType keyboard tray is rock solid. Being mounted as close as physically possible to the desk’s crossbars, the moment lever is so small that it has virtually no effect on the desk’s stability (see this entertaining Battle of the Keyboard Trays video to get a sense for the remarkable difference in stability). Gone are the sore palms from pressing down hard in order to keep your fingers in position over the keyboard as your body sways while walking. The net result is a neutral typing position (picture a sleeping astronaut, arms almost straight down) with completely relaxed hands, wrists, arms, shoulders, and neck muscles with typing proficiency equal to or better than what it is when you’re seated. When comparing an Omega desk to other models equipped with traditional under-desk keyboard trays, while walking on a treadmill, the difference in typing proficiency is so palpable that users express a clear preference for the Omega model in virtually every case. The one downside to the Omega that we should note is a reduction in usable desk surface area, which is an issue for the rare individual who routinely works with a lot of paper in front of them. 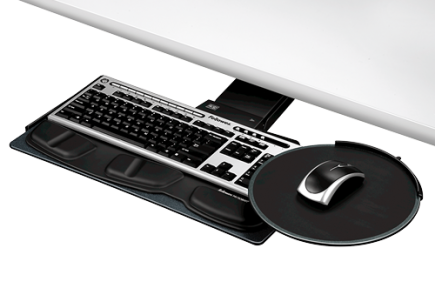 The Everest employs the same Reliant Base as iMovR’s top-selling ThermoDesk Elite desk, only with the SteadyType tray built into the desktop. As such, it is entirely made in Michigan to the highest manufacturing tolerances and incorporates dual, precision Bosch motors made in Germany. The Everest comes with the longest warranty of any electric desk, and has a full digital hand controller with four programmable presets. The Omega Everest reaches an exceptionally high 50.5″, and there’s also the option of adding another 4″ of height by using a leg extender kit, for a max height of 54.5″. Another way to get a little extra height and add a nifty feature to the desk is to add optional caster wheels to the base, plussing up the height of the desk by another 2-1/2″, for a total tabletop height reach of 57″ once you factor in the desk top, extenders, and casters. This truly is the pinnacle of top-end reach among the field of standing desks on the market today. That’s important because many stand up desks top out at 48″, the “ANSI/BIFMA” standard that most desk manufacturers strive for. This leaves taller individuals with a shaky desk at best, or a desk that doesn’t reach high enough at worst. In contrast, we’ve yet to meet an individual too tall to use the Everest and Elite—even with the additional 5″ of treadmill deck beneath their feet. It’s important to note that average-height people will definitely want to consider the 4″ leg extenders as well, because these can improve the stability of the desk for anyone over 5’8″ tall when walking on a treadmill. Here’s why that’s the case. Extending the “bottom tube” of the lifting leg significantly increases the overlap area at the ends of each of the three telescoping tubes that make up the desk leg. With the optional extenders, the Everest and Elite test out as the most stable desks on the market in our evaluations. Based on our testing, we believe they’re well worth the additional investment. At the moment, these extenders are unique to the Everest and Elite models, although we are told they should soon be available on iMovR’s UpTown and Olympus models as well. iMovR’s factory is set up to produce made-to-order tabletops on demand, allowing them to offer literally thousands of different desktop customizations across their lines of adjustable height desks. You configure your desk online, selecting from four different widths (48″, 60″, 72″ or 83″), one of the eleven standard 3D laminate colors, choosing a black or silver base. Then you can add any number of options such as a matching 2-drawer mobile file cabinet, or flush mounted power+USB nodes that go into the grommet holes on top of the desk. Being an Omega desk, on the 48″ and 60″ versions the SteadyType keyboard tray is center mounted. On the 72″ and 83″ desks you can select from left, right or center. There’s even a dual-SteadyType option on the 83″ desk, for perfect ergonomics for both the sitting and walking sides of a desk—truly the Cadillac option. 3D laminate is the most durable and attractive laminate available, and unique to iMovR in the adjustable height furniture world. It is more resistant to dings, scratches, chemicals and moisture penetration than the conventional high-pressure laminate (HPL) that’s been used by most manufacturers for decades, and allows for computer-controlled precision, ergo-contouring of all the edges prior to lamination. Even the grommet holes are completely sealed under the lamination, hermetically sealing the wood against potential moisture damage. The result is a tabletop that costs the same as conventional HPL but has the extravagant look of natural hardwood, and designed to last a lifetime. Each top is made to order, kitted on the same pallet with the treadmill and all the other purchased components, and typically ships out the door in 5-7 business days. Also unique to iMovR is the highly popular option of having the entire desk pre-assembled at the factory and shipped complete. The ThermoTread GT is not only quieter, smaller and more power efficient than competing bases, it’s the only one with a touch-screen LCD desktop console. There are many advantages to this smartphone-like console, such as making the unit “future proof” with the ability to download new software features as iMovR adds them. In designing the all-digital ThermoTread GT, iMovR knew that for widespread adoption of treadmill desks to occur in the enterprise, the liability question would need to be addressed. Unique to the ThermoTread is a built-in “click-wrap liability waiver” that the user must acknowledge with one button press before the treadmill will power up. This protects the employer, property owner and anyone in between from any potential liability, because even though no one has ever been injured on a treadmill desk at 2.5 mph or less, perception is reality, and this makes the lawyers and insurance companies happy. Up to five user profiles can be stored in the console, and next year, with the addition of iMovR’s forthcoming CloudStation adapter, users will be able to store they profiles in the cloud and access them from anywhere in the world, any time they’re at an iMovR standing desk or treadmill desk. Not only will you be able to change your desk height through the treadmill’s console, but when you change to Sit, Stand or Walk mode on the ThermoTread’s controller, the desk will also automatically move to the correct preset height, while keeping track of how much time you’re spending in each modality. And that’ll be true on any CloudStation-equipped iMovR Treadmill Desk, anywhere in the world. While the standalone ThermoTread GT supports only 5 user profiles, with the CloudStation attached there is no limit to the number of users who can log in, retrieve their settings profile, and have all their usage data automatically updated to the web, and interchanged with their wearable devices and corporate wellness software platforms. Again, see our full review of the ThermoTread GT Office Treadmill for more details. Like the Elite desk (sans SteadyType tray), the Everest is very commonly found in law firms and executive offices, where maximum productivity, supreme reliability, and decor compatibility are the driving functions. With hundreds of customizable permutations and the best ergonomics, stability, appearance, and warranty available, the Everest has already been extremely popular in high-decor offices, but now paired with the exceptional ThermoTread GT office treadmill, it is the top choice of the entire field. Almost as nice, and an even better consumer value, is the iMovR Omega Olympus desk combined with the ThermoTread GT. The difference is in the base which, while of an extremely high quality but made in China, rather than America, and with a less robust warranty. Olympus also offers nine different tabletop size options versus the standard four offered with the Everest, and all the same SteadyType tray configurations. And you can take even one more step down in price without sacrificing on the ergonomics by choosing the iMovR Omega Denali desk combined with the ThermoTread GT. The Denali’s base is a manual (crank) model, with a 200 lb lift capacity and easy-turn handle. If you can live without the electric height change feature, it’ll save you a good deal of cash. 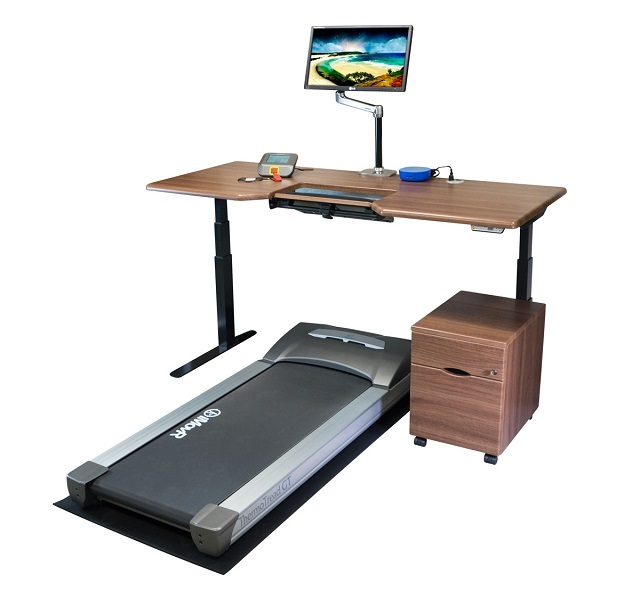 See our reviews of the iMovR Olympus Treadmill Desk and iMovR Denali Treadmill Desk for more info. Acclaimed author John Robert Marlow is an iMovR Everest Treadmill Desk user, and he writes about his experience with the desk here on his blog. *Full disclosure: iMovR and WorkWhileWalking have mutual ownership interest, and so, unlike the reviews of every other product on our site, we cannot claim 100% editorial independence. However, we can assure our readers that on this side of the fence we expose the good and the bad of every product, regardless of any financial connection we may have to the manufacturer. iMovR product reviews are done with the same editorial responsibility we have always had reviewing other third party products that we also sell in our stores. Do you sell a seat to convert the desk to seated? I would like one that can transition quickly from standing to sitting. I would like to buy one within the next few weeks. Thanks for stopping by. iMovR sells two ergonomic chairs on their website. Both can be used with a treadmill or sit-stand desk.